9.10 train from East Croydon (9.21 Streatham Common, 9.28 Balham, 9.39 Clapham Junction, 9.50 Kensington Olympia, 9.53 Shepherd's Bush) to Tring, arrive 10.39. Buy a day return to Tring, which also covers you if you come back from Berkhamsted. I am not going to lie to you. 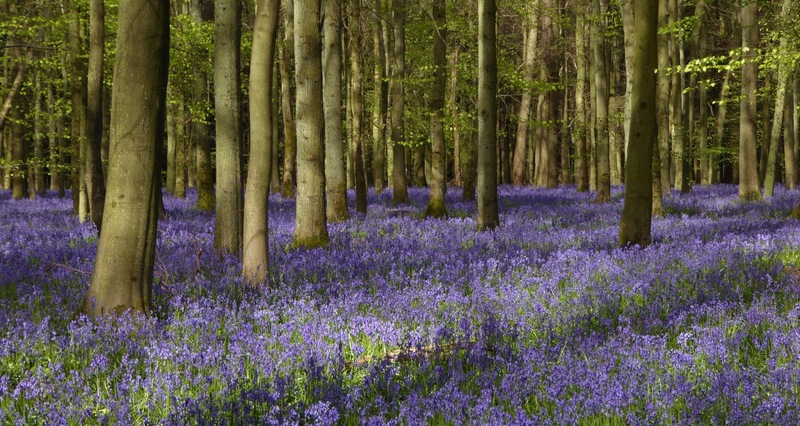 It MAY be starting to get a bit late for the wonderful Ashridge Estate bluebells. But on the other hand they are often out ten days or more later than ones further south (and lower down). I can attest that on 5 May they were glorious. The famous wood here is Dockey Wood (paragraph 31 in the directions) but for my money the best of all - the best bluebell wood in England (sorry, West Wood...) is the much-less visited Flat Isley (paragraph 51 in the directions): that is the one in the photo. If the bluebells are over, you still get a glorious ridge walk in the morning. If you are a sandwich eater, there is nowhere better to stop and eat than Ivinghoe Beacon. For pub lunchers the Bridgewater Arms is often busy but we manage to squeeze in somehow. After a nice walk through the woods (listen out for all the blackbirds singing and notice the lovely fresh green beech leaves) tea at the Brownlow Cafe (an outside kiosk) means waiting in its glacially slow-moving queue, but otherwise this is a lovely spot. The extension to Berkhamsted is worth doing if you have the energy and has more bluebells in its early stages. Trains back are frequent - 10, 26 and 56 past until at least 8pm (after that check: you all have smartphones!). The return train to Clapham Junction etc is at 34 past until 19.34 (the last one). Euston-bound passengers can take this and change at Watford Junction. At 4.40pm on Friday I uploaded a new version of the pdf for this walk, incorporating some updates and changes to options a) and c). The main walk and option b) are unchanged, but if you are using the later version of the pdf some paragraph and page numbers have changed. N=19 6 off the Clapham train, 12 off the Euston train and at least 1 joining at the pub. W=cloudy-start-sunny-later The beeches along the Ridgeway were at their vibrant best with new leaves. Yours truly split off at Ivinghoe for the shortcut to the monument, so yours truly can’t comment on the pub. The bluebells were still out in force. Some spectacular splashes of colour on approach to the monument. I heard Flat Isley was good – I actually missed that , unless the patch I saw was part of it – but there were good shows at the start of the Berkhamsted extension, just past the paddock at Brownlow. Plenty to gush about. Also worthy of mention, buttercup meadows, speedwell and cowslips. I know of two others did the Berko bit. I’m guessing the others finished at Tringo.